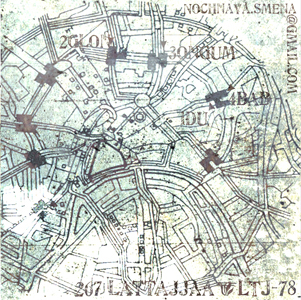 "Self-proclaimed punk-ambient from Russia, recorded as trio in 2006-2007. Moscow-Yaroslavl". Released 12.1.2009. "Russians are like that - spooky bastards with a knack for soul-forbidding punishment but handy at destruction. Punks, to put it mildly. Alt-Shift-Ctrl-Delete, and yes, Delete most of the time. God, what did we do there? Like an animal collective of superdrones we poured desolate stillness of steel all over the horizon. Thank God, my family doesn't hear this EP. In the beginning you are welcomed into the swampy, clattering - how's it called - metal plate? Not unlike Pirhan Gregson's early stuff, a tragic ambivalent "beyond death and impoverishment" vibe sucking you heavily into the place changing colors all into gray and right down pessimistic (phew!) under your supposedly healthy anti-Kremlinesque breath. And that's just the beginning - holy frogs rolling lonesome in the name of compositional potention (potence? Potentity?). 'glon' is something Kallar Jurchen could put out while not so buried under her fruit-woman radio-debris legacy. It's a berserk radio, holding its head in "Oshi!" gesture, while demons dug their nails into the living shroud, accelerating Billy Idol style and then giving up their strapons for something vocodery and limp. 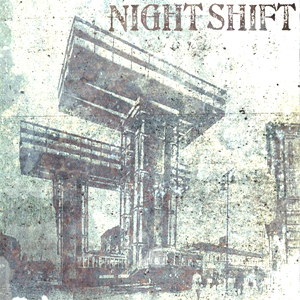 "Hailing from Moscow and Yaroslavl, Nighshift is a so-called "punk-ambient" trio. The label "punk-ambient" is not a word that is thrown around often but don't let it fool you, it's not far off from ambient industrial music. The term could make sense in their case though; it definitely has an ambient feel and flow to it but sped up and more energetic than standard ambient music.